Skiggle is a self-funded, non-profit on-line community that I launched on 17.08.16. I am mother whose young son, with Cerebral Palsy is the inspiration behind the idea. 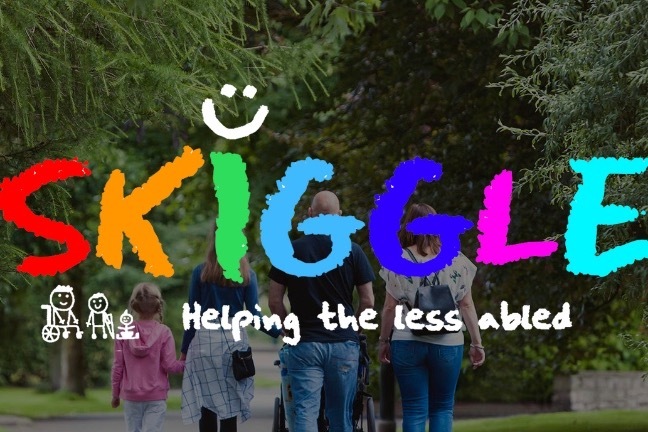 Skiggle's aim is to help people, of all ages, who are involved with disabilities either in a personal or professional capacity. The primary goal is to create a mutual support network for users to provide each other with practical help. This is achieved through the creation of a cloud-based SOS solution system for care-based essentials where our members can request immediate assistance in unforeseen circumstances. Many of the individuals who come into contact with disabilities have a significant store of what can be described as consumables (such as feeding accessories, specialised food, breathing apparatus and continence products) AND have also been in a situation where a vital consumable is missing. The idea is to create a network of individuals willing to help others by providing missing consumables, free of charge, from their own (surplus) stock, in times of need. The site also has a marketplace feature where users can donate or buy/sell items pertaining to a wealth of disabilities. This feature also has our bereavement angel; an icon that users can select if they are using the site due to personal loss. What social need is Skiggle aiming to address and who will benefit? It is an unfortunate reality that the NHS can’t always provide support, especially when it is needed unexpectedly. 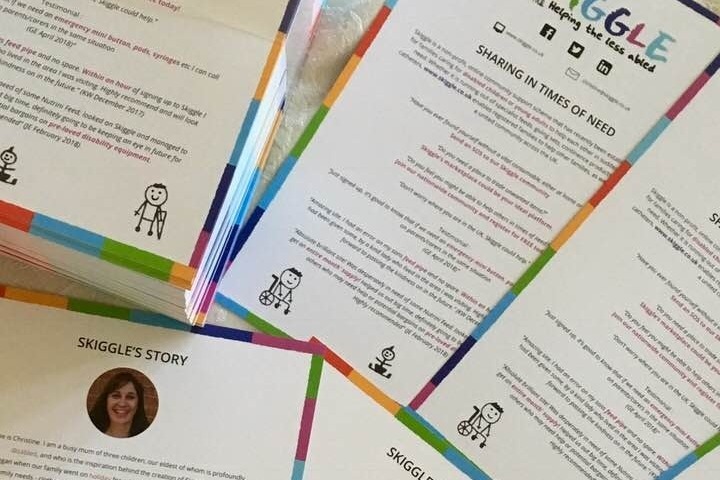 Skiggle aims to encourage parents, carers and individuals who exist within the world of disability to support one another when professional services cannot, and address the issue of being left without something essential. Skiggle's story began when I went on holiday with my family for a few days. After packing the normal things that every family needs - clothes, food, and the buckets & spades - and then everything that our son needed, including medication, continence products, breathing equipment, hoists, indoor supported seat, tracheostomy, the normal ton of extra clothes for the inevitable mishaps and the kitchen sink - we set off. We were having a brilliant time, but suddenly we realised that we had forgotten to pack a box of milk feed; feed that our son is reliant upon and imminently needed. What do we do now? We rang the out-of-hours doctor who assured us that she would be able to get us the feed we needed. However, three hours later she informed us that she had been unsuccessful and that our “only option was to either drive home or put him into a regional children’s hospital!” So, as to avoid unnecessary risk of infection, we felt our only option was for one of us to leave the family and drive home. This experience gave my husband and I reason for thought; if only there was a warehouse that stored everything you could possibly need, open and accessible any time of the day or night. But where would this be located, as no one location would be suitable for all? That was the light bulb moment… many of the people who have additional needs have a ‘warehouse’ at home whether it’s in the garage, shed or a spare room. Someone somewhere could have almost certainly helped us, they could have lent us some feed to tide us over, and we could someday have returned the favour. The idea of Skiggle's SOS service is that everyone signs up to helping someone in need for no other reason than it’s the right thing to do. Clearly we are not expecting anyone to try and profit from the provision of this service. Local television station 'That's Lancashire' have shown their support for Skiggle! Skiggle is currently a self-funded enterprise, with only limited funds to continue paying into the growth and development of Skiggle. Donations would mean that I could not only pay for the maintenance costs of the website itself, but also to promote the idea and grow the Skiggle community. Apologies for the delay in posting this message. 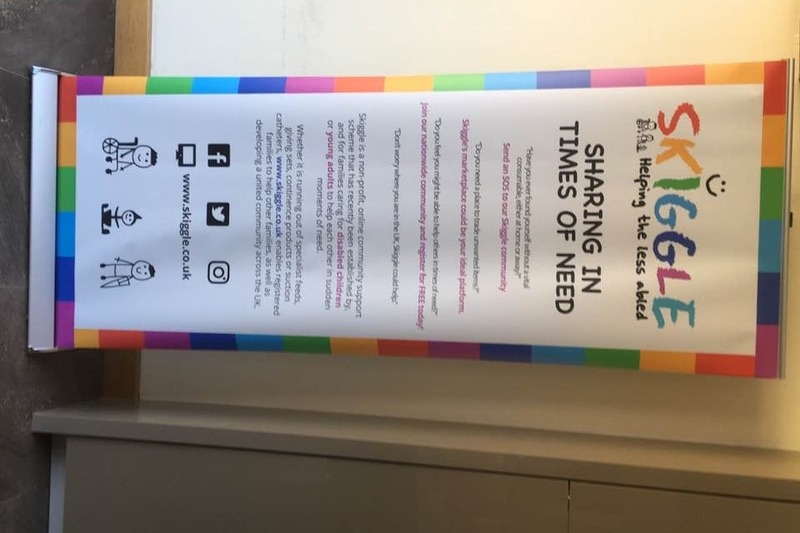 Skiggle is keeping us very busy at the moment :-) We were able to purchase leaflets and a roller banner with the money that Helen was able to raise running her half marathon at the Simply Manchester Run 2018. Leaflets are already flying out of the door and our banner has been used multiple times - with many more to come! We are incredibly excited about Skiggle's growth at the moment, so thank you to you all for your support. Thankyou to #blogpreston for a supportive write-up of my half marathon!